Will Le Cache racking fit my bottles? 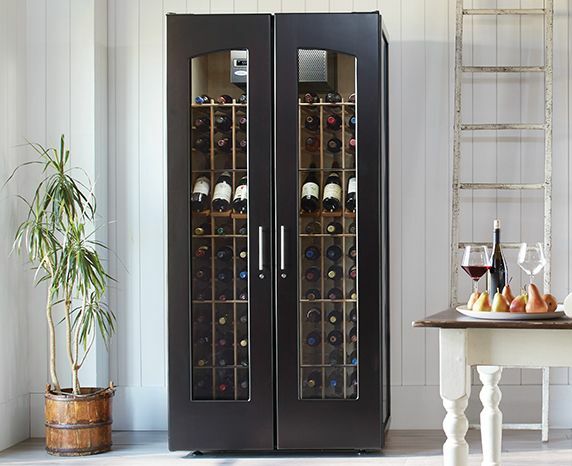 All Le Cache cabinets come equipped with universal wine racking, designed for stability and convenience. Learn more about our racking and how it differs from what you might find in competing cabinets. Larger Burgundy and Champagne bottles. Every slot in our cabinet racking measures 3.75" wide. By contrast, the standard racking slots in most competing cabinets are only 3.25" wide and cannot fit Burgundy and Champagne bottles. Other companies charge extra for larger racking, but we include universal racking in all of cabinets for no additional charge. If you're unsure whether a bottle in your collection will fit in our racking, just measure across the base of the bottle and check that it's not more than than 3.75" in diameter. What is the racking made of? Wood or metal? The racking in every Le Cache cabinet is made from solid wood. Our racks are completely finished and sealed for a silky smooth feel that will withstand the high-humidity conditions inside the cellar. Eased edges: Bottles lay on supports with rounded edges—soft on the bottles and on the hands. Tapered ends: The ends of racking supports are tapered to create a sleek and elegant aesthetic. Precision fit: Each rack piece, from vertical risers to horizontal spreaders to bottle supports, is assembled with interlocking joints to provide structural strength and long-lasting durability. Hot-glue assembly: Instead of nails that can rust, loosen over time, or weaken the integrity of the wood, we apply hot-glue to each joint during rack assembly to ensure strong and long-lasting construction. Unlike metal racking, all-wood wine racks won't scratch bottles or tear labels. Metal racking sometimes buckle and bend under the heavy weight of wine bottles, whereas sturdy hardwood wine racks keep their shape. And, of course, wood wine racks won't rust in the high-humidity environment inside your cabinet. Try sliding a bottle in and out of a metal rack—then do the same in a wood wine rack. Which feels better to you? What's the difference between "racked" and "total" bottle capacity? Racked capacity may be lower than total capacity. Racked capacity refers to the number of spaces in which individual bottles will rest. Many wine cabinet companies advertise their wine cabinets with the total bottle capacity (as a range). However, you may be able to store the maximum, total capacity reported by a cabinet manufacturer only through less-than-ideal conditions. To fit the higher number of bottles in the cabinet, you may have to stack bottles on top of other bottles. Unfortunately, resting bottles on bottles increases the chance of breakage or scratches. Labels can smudge or tear. Once stacked, bottles also are much harder to access than individually racked bottles. At Le Cache, we try to make capacity simple to understand by breaking up racked, bulk, and total bottle capacities individually. We don't inflate our numbers at the expense of storage conditions. The majority of bottles rest directly inside the racked slots in Le Cache's all-wood racking. We also include bulk storage above the racking, where you can safely stack a small number of extra-large bottles. For instance, our 2400 model cabinets can hold a total of 286 bottles: 256 inside the racking and 30 in the bulk space. We've made charts to compare capacities (and other specifications) from Le Cache and other wine cabinet manufacturers. If you have any other questions about our racking, Le Cache cabinets, or wine storage in general, we’re happy to answer. Call one of our experts toll-free at 1.877.532.2243 or ask us through a live online chat. You can also use our contact form.